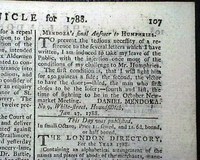 All of the following issues have content related to Daniel Mendoza. 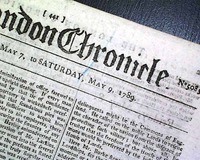 In most cases, if duplicate issues appear for the same date, the item with the highest item # will have the most up-to-date information. 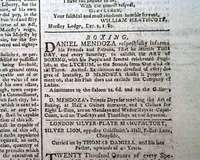 Enjoy this exploration of this notable figure: "Daniel Mendoza via Rare & Early Newspapers." 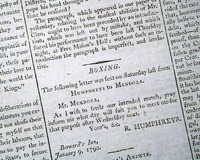 THE LONDON CHRONICLE, England, Jan. 24, 1788 Inside has a nearly column-long article headed: "Humphries Reply to Mendoza" which is one of several letters between these two boxing rivals, which did much to hype the 3 notable boxing matches between them. 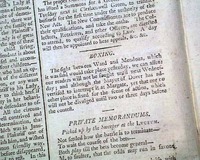 The letter is signed in type: Rich. 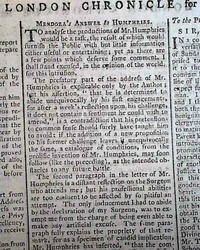 Humphries (see). 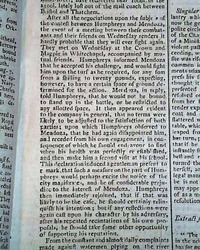 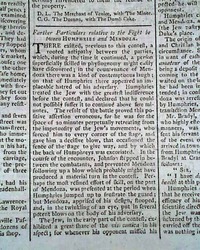 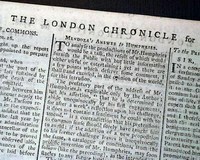 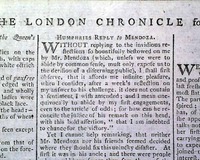 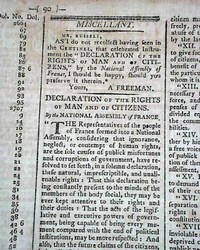 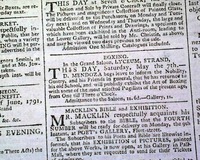 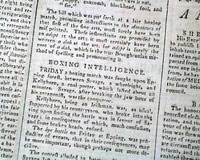 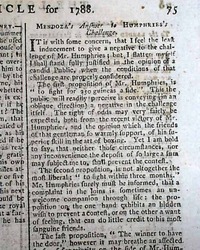 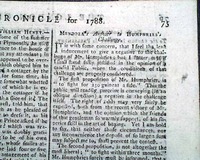 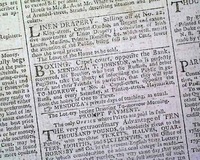 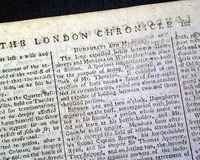 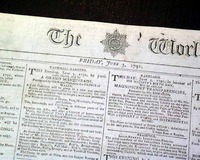 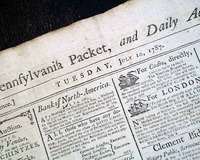 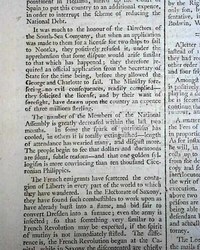 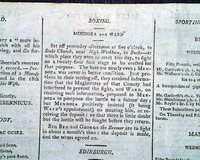 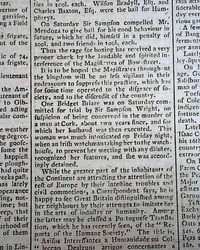 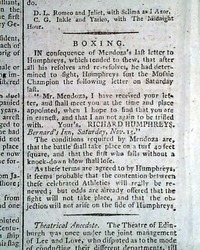 THE LONDON CHRONICLE, England, Jan. 26, 1788 The top of page 3 has: "Mendoza's Answer to Humphries" concerning a boxing match, signed by him in type: Daniel Mendoza. 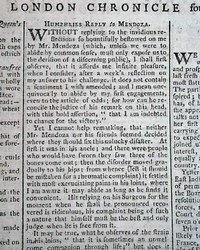 (see) This letter takes most of the middle column. 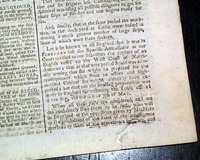 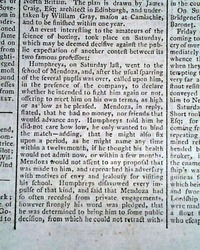 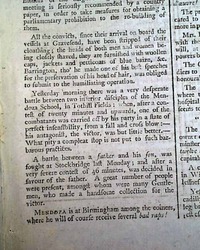 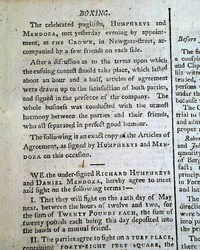 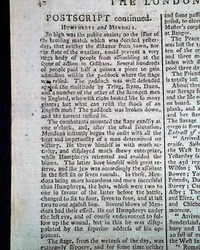 The top of page 3 has: "Mendoza's Answer to Humphries" concerning a boxing match, signed by him in type: Daniel Mendoza. 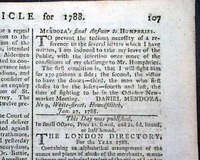 (see) This letter takes most of the middle column. 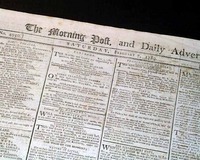 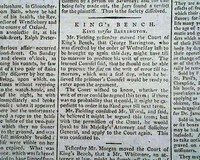 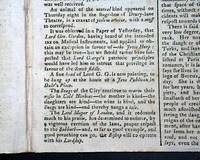 Page 3 has a report of George Barrington (of eventual Botany Bay fame) being before the King's Bench, headed: "King versus Barrington" (see). 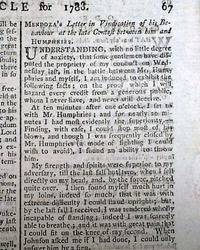 The hyperlink has much on Mr. Barrington. 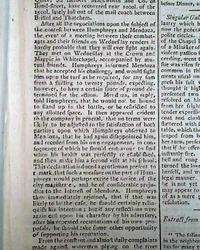 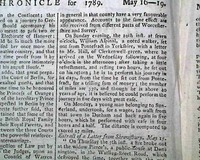 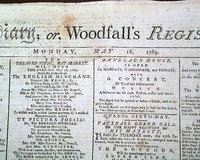 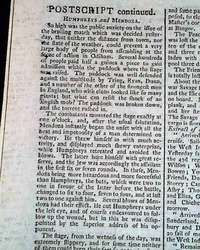 THE LONDON CHRONICLE, England, May 9, 1789 Page 3 has a lengthy & very detailed account of the famed second of three boxing matches between Daniel Mendoza Richard Humphries. 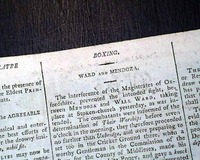 Near the end it notes: "...With regard to skill in the conduct of this boxing match Mendoza appeared evidently to have the superiority..." with more (see). 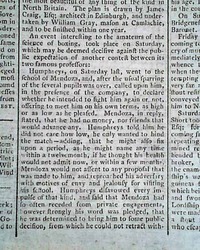 Page 3 has a lengthy & very detailed account of the famed second of three boxing matches between Daniel Mendoza & Richard Humphries. 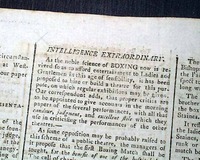 Near the end it notes: "...With regard to skill in the conduct of this boxing match Mendoza appeared evidently to have the superiority..." with more (see). 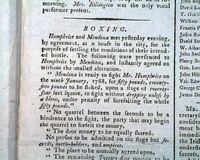 Mendoza's boxing school is promptly shut down..
COLUMBIAN CENTINEL, Boston, June 1, 1791 Page 3 has an election for governor report, reading: "The whole number of votes this year for Governour were, 17,032--of which His Excellency JOHN HANCOCK, Esq. 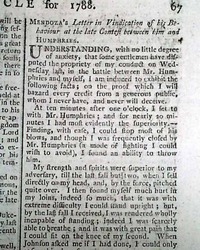 had 15,996. 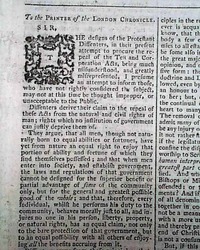 Whole number for Lieutenant-Governour were 14,998--His Honour SAMUEL ADAMS had 13,032."